Checkmate captures the mood when America faced its first economic threat by a rising foreign power. 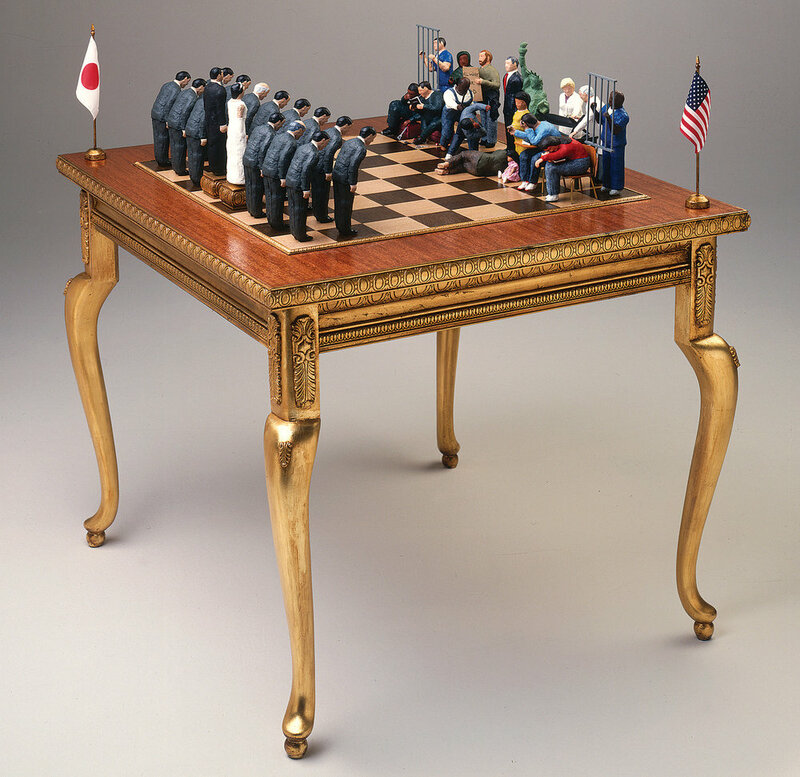 The sculpture offers a visual comparison of two nations – Japan and the United States – locked in competition during the timeframe associated with Japanese ascendancy and American malaise. The title of the sculpture is in Japanese and translates to Checkmate in English. The work is comprised of 32 figures, 16 per side, on a 48” by 48” gilded chess table. It is a window into the turbulence of the times. On one side is the United States, a power in disarray; on the other Japan, a nation that in less than 50 years transformed itself into an economic power and chief rival to a country responsible for its rebuilding. The American line-up features a variety of country concerns and ills: education, teen pregnancy, the homeless, incarceration rates, urban violence, auto manufacturing quality, and defense industry prioritization. The Statue of Liberty is in the queen position, a homeless woman at her foot. The President stands erect, his attention focused on his opponent. In contrast to the apparent U.S. disarray, the Japanese line-up consists of His Majesty the Emperor, Her Majesty the Empress, and 14 nearly identical male figures bowing in unison towards their opponent. The stately elegance of the table defines the importance of the competition. Initial appearances notwithstanding, the result of the competition is not a fait accompli. In the ensuing time period, the U.S. was able to reverse the trend and take leadership in new and lucrative high tech industries while the Japanese framework suffered. Highly motivated, developing and resurgent Asian and European economic powers add complexity now to international competition and leadership. Checkmate has been profiled in the major Japanese media including Nippon, Tokyo Broadcasting, and Asahi Television, and the Asahi, Yomiuri, and Tozai publications. This work has been featured in Harpers Magazine and the Conference Board publications. Checkmate is one of the signature chess-related creations featured in the four-volume book collection, “Cultures, Chess and Art,” by Ed Munge.